The first shot of Josh in the pilot episode shows him asleep on his desk, waking up to the sound of his pager (clue #199 that this show is set in the 90s). In the first shot of the series finale, we see Josh waking up again. He looks over at his alarm clock before a hand affectionately brushes across his back. Instead of alone at his desk, he’s at home in bed with his future wife. It is also a touching nod to Election Day Part 1, a few episodes earlier, when, after Josh and Donna sleep together for the first time, he rolls over to touch her and then wimps out. Now, they are unequivocally together. We see him turn over, this time to face Donna, and the shot lingers on the two of them gazing at each other. 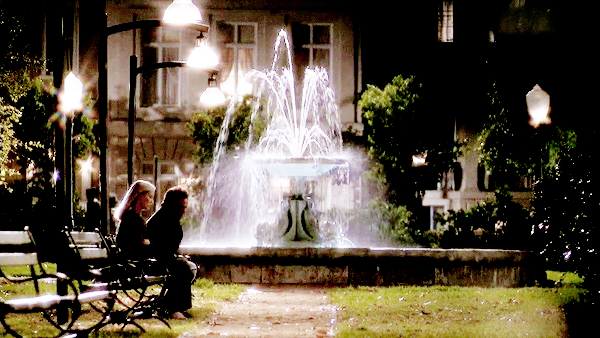 Real question: is that the Friends fountain? It has become a tradition between my best friend and I that we rewatch, and heckle at, this episode every time we are together. I can’t pretend this personal attachment hasn’t factored into my decision to put it on this list. However, it’s still a deserved choice. It is the aftermath of the president’s MS revelation and the west wing staffers are up to their necks in depositions. When Donna’s turn comes, the person hearing her deposition is none other than her former boyfriend, amiable Republican, Cliff “please laugh at my jokes” Calley. 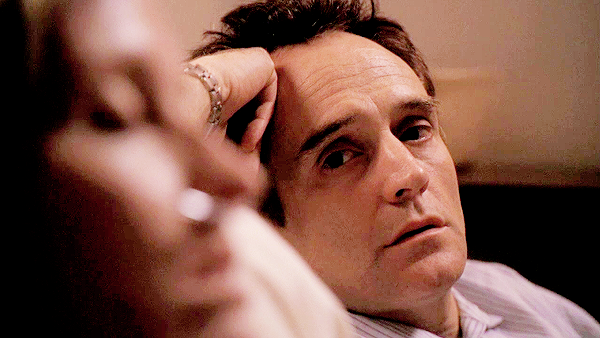 After she lies about keeping a diary, Cliff tells Donna that he saw it while staying over at her apartment. Panicked, she seeks Josh’s help, confronting him with the reality that she both slept with somebody that wasn’t him and also lied in her deposition. He’s not psyched about this news, unsurprisingly, and the reaction shot of him as he lets the news sink in is one of the more tormented Josh faces we see. 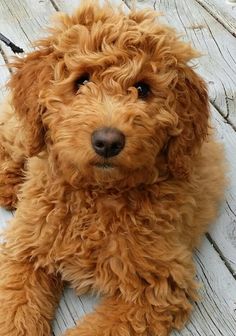 Sad, precious goldendoodle. After one of the more traumatic arcs of the series comes this beautifully quiet, private scene as Donna wakes up after her surgery. Indulging Josh/Donna fans everywhere, she mutters his name before she’s even come to. Josh is her first thought as she re-enters consciousness; he’s her first thought, he’s the person that she needs to be there with her. You could argue that it’s Josh’s name that we hear because even as she’s barely conscious, she knows well enough that he’ll be the one who’s there. And sure enough, having flown halfway around the world to be with her, he’s right beside her. And the eyes. The big stupid heart eyes. Josh: Yeah, I’m still here. Because of course. The subtext. The unsaid. The thousand words of, “Where else would I be? I will never leave you. I’m not going anywhere. I love you. I’m in love with you. I want to be with you forever.” Leave me here to die. And then he pulls up the blanket up for her and perches on the side of her bed as it fades to black, Josh gazing at Donna as Donna gazes at Josh. Donna: You came back to me. Josh: Just like I promised. Josh: When did you find you missed me the most? Josh being in love with Donna is news to no one. Except this episode is kind of the long-awaited newsflash moment for Josh. Donna wants to date Jack. Josh agrees to talk to Jack and in doing tells a handful of ridiculous stories about Donna. “Why would you tell him that?” Donna asks in outrage, as he lists the humiliating tales he’s retold. Of course, the answer is that Donna accidentally voting for Richie, nearly getting arrested trying to retrieve a letter she wrote to Ilie Nastase, leaving her underpants at an art opening and trying to to smuggle scented candles only makes Josh loves her more. When he says, “These are endearing stories”, he means it. When she argues that the stories are only endearing if you already like her and that she wouldn’t have mentioned them, say, at her job interview, he replies, “When you were trying to get the job, you were pretending that you’d already got the job, so it’s not like your underwear at an art gallery was going to change my mind.” In a single reference to that spectacular first meeting of theirs, it becomes crystal clear that this Donna – underwear at an art gallery Donna – has owned his heart from Day 1. It’s later on, after Jack agrees to go out with Donna and she’s glowing with excitement for her date, that the heart-stopping declaration occurs. The way it’s filmed is as though it’s a private moment between Josh and his feelings, with the viewer peeking intrusively in. Even Donna remains oblivious. “Those are good stories about you, though. Those stories would make me like you,” he insists, with sweet vulnerability. There’s no doubt in this scene that he’s looking at his favourite person in the world, wondering if she’ll notice and hoping she won’t go. She doesn’t and she does, respectively. This moment is so outrageously romantic that it would probably better fit the end of a romantic comedy. Except, I guess, in a romantic comedy there would be more kissing. Or at least some kissing. It even starts with Josh throwing snowballs at Donna’s window, which, really? Really, Josh? 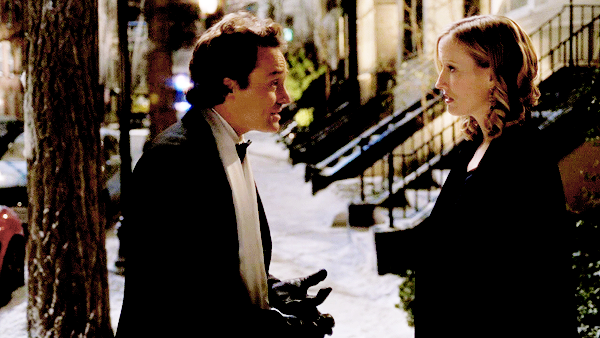 Then, on Donna’s apartment steps, against the backdrop of a snowy winter night while they’re all dressed up for the inauguration balls (all eight of them), Josh abruptly stops mid-rant to tell Donna, “You look amazing.” It’s unusually direct for Josh and a moment that, the first time you watch it, makes you grab the remote to rewind because you can’t possibly have heard it correctly. Now I know I heard it correctly, the rewinds are just for kicks. They look like two kids going to prom as they set off in the limo. Oh yes, and let’s not forget the fact that there aren’t enough seats and she’ll just have to sit on Josh’s lap. It’s the only solution. America depends on it. Also, please note that in the same scene, Charlie says, “I took off my coat to show my love for Zoey,” which makes approximately no sense except for the fact that Josh does exactly that to give his to Donna. He took off his coat to show his love for Donna, nbd. This scene gives us the great, “You are better than my old boyfriend” chestnut that probably rolled around Josh’s mind every second of every day until they were making out in a hotel room. Godammit, you two, did it need to take seven seasons? Josh: If you were in an accident, I wouldn’t stop for a beer. Donna: If you were in an accident, I wouldn’t stop for red lights. Cut to Donna sauntering out with so much confidence and conviction, Josh is left standing in the doorway looking totally wonderstruck. When consulted, my best friend had this to offer: “I would come up with something that sounds less ‘Josh worships the ground Donna walks on’ but he literally looks like he’s just been visited by an angel of the Lord, so I would be lying.” That about sums it up. I think a part of him really thinks she’s going to walk straight up to him and kiss him; instead she leaves, and I sense his disappointment. It mirrors my own. It’s the speed at which they fall into their familiar banter that really makes this such a winning scene. While I think love at first sight had a hand in Josh’s hiring of Donna, as well as her impressive assertiveness, there is an argument to be made for it being her ability to keep up in her introductory walk-and-talk, a crucial aspect of the job. Real question: is Donna the most skilled walk-and-talker of all? She really took to it fast. Christmas has often delivered big time on the Josh and Donna front, but never more so than in the first season. Donna was still just a recurring character, while the show was yet to write off all hope for a Josh and Mandy romance. In Excelsis Deo was the moment it became very clear that it would be worth the long game for Josh and Donna, and was undoubtedly, for many, the big beginning of the great love story. After Donna has pestered Josh all day long about the many skiing-related items on her Christmas list, he gives her “The Art and Artistry of Skiing”, with a handwritten inscription, the details of which we shall never know. All we do know is, Josh meant it. Of course, every frame of this particular scene is a stunning display of LOOK HOW IN LOVE THEY ARE, but my heart lies with the closing moments that show Josh coming back for an extra glance at Donna as she admires her gift. She’s enamoured, and so is he. This particular moment was not in the script but a later addition, courtesy of director Alex Graves. These precious seconds are the earliest indication that their unresolved sexual tension translated into real, deep, romantic feelings on Josh’s part. If you really watch the scene, it’s so much more about his feelings for her. Because it’s Christmas, he gifts himself one last look before tearing himself away. It’s these tiny moments of weakness that give away Josh’s feelings and fuel me through the long, long wait for that finish line. What do you think? Has my omission of all of their kissing scenes left you raging? Had you forgotten some of my beloved moments? 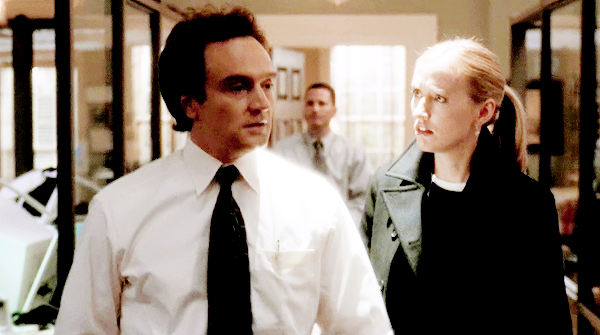 Do these moments all pale in comparison to the many romantic scenes you imagine for the Donna-centric spinoff, The East Wing? Pray tell. Lovely list! I actually love that you left the kisses off, as all the moments you listed are development and the kisses are more inevitability. The only thing I might have included (though I’m not sure what I’d cut to fit it in) would be the two of them on the plane in ‘Transition.’ That’s such a huge moment for them and such a big step for Josh to take, particularly after Donna’s earlier speech to him about figuring things out, and it’s exciting to think that they’re about to spend a week together, just the two of them, saying all the stuff they avoided saying the last eight years. Yeah, it makes me so happy. There’s a scene in an early episode with her lightheartedly telling him that he should take her to Hawaii, so that’s always where I’ve assumed they’re going. They call talk it all out in Hawaii. This is wonderful. I ship them so hard. And I did not know about the stage direction. Life is so much better now. This is a great and feels-inducing list. Nomination for an honorable mention: “And if you think I don’t miss you every day.” The noise my heart made when he said that was just ridiculous. That’s a beautiful scene. It hurts, though! Big time. They both look so sad. Sad eyes, full hearts, can’t lose. Excellent choice. 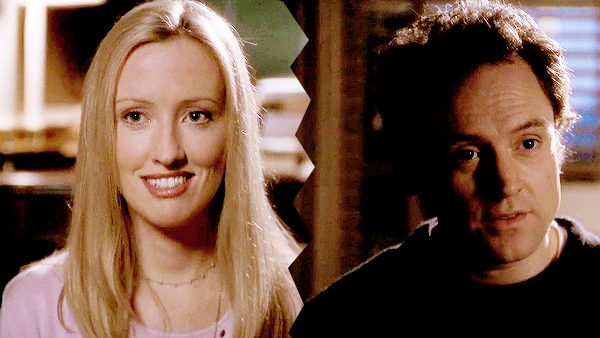 I always liked the moment in Noel where Leo says “She was the one who guessed” and then Donna shows up to take Josh to the ER and they got outside and he starts to get freaked out by the carolers and all she says is “Josh, let’s go.” However that’s not as much a pure Josh/Donna moment and I wouldn’t put it about any of these. This is a great list! That really is lovely! 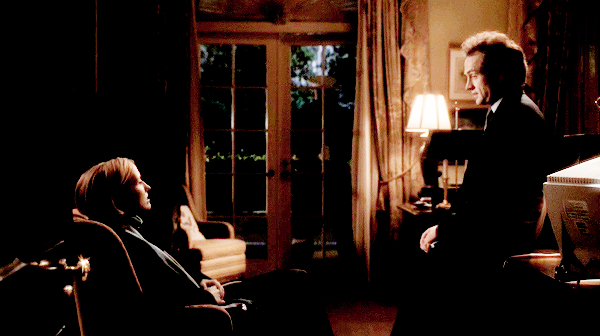 She’s so supportive of him through his PTSD ordeal so that is a really beautiful moment. If the list was a little longer, that would definitely be on there. I’m glad you like my choices! It was really fun to put together. Hi, it’s me again. I came back to leave another comment because I realized I forgot to mention before that absolutely love your analysis on #10. It’s like you took exactly how I saw that scene and put it into words, especially Donna’s brief reference to the shooting. Thank you! That’s so nice. I’m glad I could sum it up in a way you enjoyed. That one really is a favourite for me. I wouldn’t stop for red lights… So perfect. Making me want to go back and watch them all again. I love Josh and Donna, and all the emotional and sexual tension that is evident years before they finally consummate their desires, so to speak. BUT, did anyone else dislike how they finally got together in the end? The heat-of-the-moment, sleep-deprived impulsivity in which they confused happiness for the campaign with love for each other? And the next day awkwardness? There was no romance. I was hoping they’d get together after Donna got hurt in Israel. Josh demonstrated his caring and devotion when he went to be by her side in Germany. I definitely know what you mean. I vacillate between LOVING how they got together and being a little frustrated by it. I think I could have definitely loved it more had there been more Season 7 buildup and a bit of a post-consummation feelings declaration from them. This show was all words, words, words and then when it came to Josh/Donna getting together didn’t really deliver on that front. Reblogged this on EVERYTHING'S EVENTUAL. One of the best blog posts I have ever read related to ‘The West Wing’. Here I am reading your blog having gotten into the sixth season and warmly looking forward to the series finale. I had to pull it out to get through the current administration. If it takes another four years with this group, I’m sure I’ll pull the seasons and this blog out more. Thank you for your musings. Very warm. And that is much needed these days, post 11/9/17. Very well written. Appreciate your effort. Enjoyed every word!! !